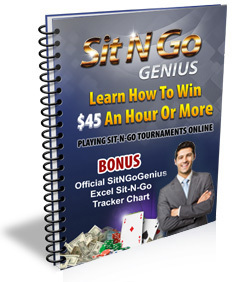 Been thinking of how you are going to track how you are doing using the Sit-N-Go Genius Course? We got it all worked out for you! We have worked very hard to program EVERYTHING you need to track your results. Simply plug in your results and this handy Excel chart will do the rest. You'll instantly be able to see your stats for ITM (In The Money), ROI(Return On Investment), and Total Profit/Loss. Amazing tool to keep track of your results! $49.99 VALUE - FREE TODAY!! $109.98 TOTAL IN BONUS OFFERS, ALL FREE TODAY!! 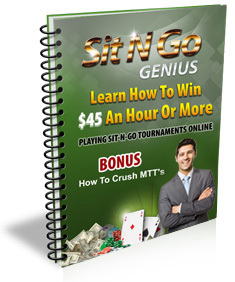 How To Crush MTT Course for the LOWEST PRICE EVER OFFERED, $67.00! IMPORTANT: After payment, you will be directly sent to our encrypted download page where you can download your product instantly. P.S. The price of this course has been sold for as much as $149.99. The price of $67.00 is the lowest this course has ever been offered and is only valid until Midnight, . Pick up the course today while it is only $67.00, do not fall victim to a sudden price increase. Poker View 35% Cash Back Promo Available By Using This Poker View Link.